MWM NEWS BLOG: Free Form Flow. 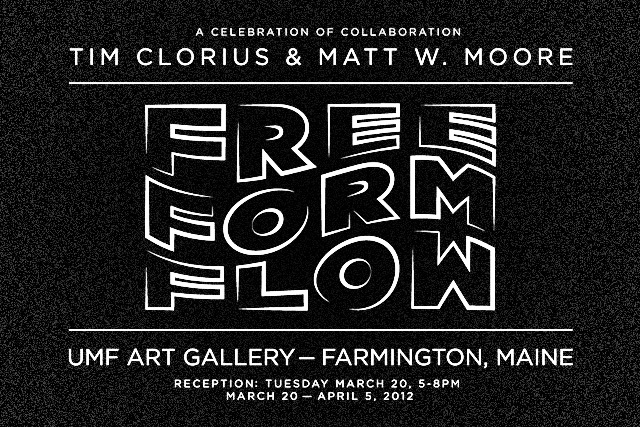 Looking forward to this 2-man show at UMF Gallery (Farmington, Maine) with my big bro Tim Clorius. We'll be showing recent works alongside a large new collaborative mural. Tim and I have cosigned a bunch over the years (2006 + 2008) and he's been a key mentor for me. When it comes to Technique & Finesse with a spraypaint can this guy is a black belt. Free Form Flow opens on March 20th from 5-8pm and runs thru April 5th. UMF Gallery. 246 Main Street, Farmington, Maine. Save the date fellow Maine-iacs!